"Joy shall be in heaven over one sinner that repenteth," Jesus is reported to have said in St Luke's Gospel. One must certainly render expressions of joy to Melodiya for their presentation of this opera, the last that Prokofiev wrote. In the past two years I have persisted in bemoaning the cheese-paringly inadequate documentation supplied by Melodiya in their reissues of rare and often unique Russian operas. Here at last is a serious attempt to address at least some of those concerns. We have an adequate and fairly detailed (although uncued) synopsis of the plot, a cast list which gives us the full names of the singers concerned, and a booklet note which at least avoids some of the grosser mistranslations found in earlier issues even if it is not always idiomatic - "deliriates on a hospital bed" sounds inelegant at best. All we need now is the provision of complete texts and translations, and our rejoicing would be complete - the text was provided with the LP release of this performance issued in 1976. I just hope, to provide a completely different metaphor, that this is not a case of "one swallow doesn't make a summer" and the improved standards of presentation will be maintained in future issues. Rejoicing is all the more due because this reissue enshrines the only complete recording ever made of The story of a real man. The opera was given one performance only during Prokofiev's lifetime, and then disappeared altogether from the repertory until the Bolshoi revival of 1961 which formed the basis for this recording. The booklet tells us that this revival incorporated some revisions both of the text and music of the opera, but fails to let us know whether these were approved by the composer or whether they were well-meaning attempts to make the subject more palatable to the Soviet authorities; this was, after all, the era when the Soviet National Anthem was substituted for the Tsarist one in some Russian performances of Tchaikovsky's 1812 Overture. Reviewing an earlier CD release of this performance on Chandos (which included both text and translation) for BBC Music Magazine in January 2003 David Nice noted that "much of the original score is missing" so it seems that the edition employed here may not be as complete as one would wish; David Fanning, reviewing the same reissue for Gramophone in the same month stated that "there are numerous small internal cuts and a few larger ones involving minor characters; both the bright and breezy overture and the rather feeble concluding number are here replaced by more conventionally uplifting music, taken from the third entr'acte in Act One." While Rob Barnett for this site observed that "on the debit side this recording is not the full opera but a version with significant cuts and with scenes rearranged" the Penguin Guide for 2003 more tolerantly described the cutting as "judicious". 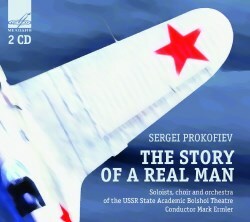 What we really need is a good modern recording of the complete opera as Prokofiev originally wrote it, but we need not hold our collective breath unless Gergiev can oblige; an issue to commemorate Prokofiev's centenary in 2004 anticipated by David Nice never materialised. As it is, we should be grateful for the reissue of this performance despite its apparent disregard for the composer's original intentions. This is all the more the case since the casting, including many of the Bolshoi's most eminent soloists, is so good. In his review of the Chandos issue for this site Rob Barnett discussed the plot at length, and I do not propose to repeat this material here; but the score is not simply the piece of Soviet nationalist propaganda that is often described, having - as one would expect from Prokofiev - many moments of arresting beauty and drama. There are indeed sections of the score which match for inspiration the film score for Ivan the Terrible written at much the same time. Some of the criticisms made by others have focused on the lack of sustained inspiration, attributing this to the composer's weariness and despair in the face of persistent official disapprobation. It is true that the impression conveyed here is often somewhat bitty, moving too rapidly from one idea to another without any sense of musical development; but at the same time it is far from clear whether this is the fault of Prokofiev or of the cut edition employed here. The performance does everything that can be done for the score. The young Mark Ermler in one of his first recordings is clearly fully committed to the opera, and he obtains splendid playing from his cast and orchestra. The cast is stellar, including singers of the stature of Artur Eizen and Alexei Maslennikov in comparatively small roles; there are a fair number of Slavonic wobbles on display, but these are to be expected in Russian performances of this period, and none of them are particularly objectionable. As also is to be expected in Russian recordings at this time, the heavily engineered sound brings the voices too far forward in the balance, but the orchestra remains well in the picture; and although the result still sounds artificial, this too is acceptable in view of the historic importance of this issue. I have not been able to compare the quality of the transfer in this release with that obtained by Chandos in 2003, but the recording is described here as "re-mastered" from the original tapes. Those who already have the Chandos release, with its text and translation into four languages, will not need to replace it; those who have not should seek to make the acquaintance of a far from negligible score. I just hope that Melodiya's newly acquired standards of presentation will be maintained. In the meantime we may possibly be able to take comfort from the fact that persistent adverse comments may have persuaded the company to provide a better service. It may indeed be possible that, contrary to the opinions of some correspondents, critics have their uses after all.